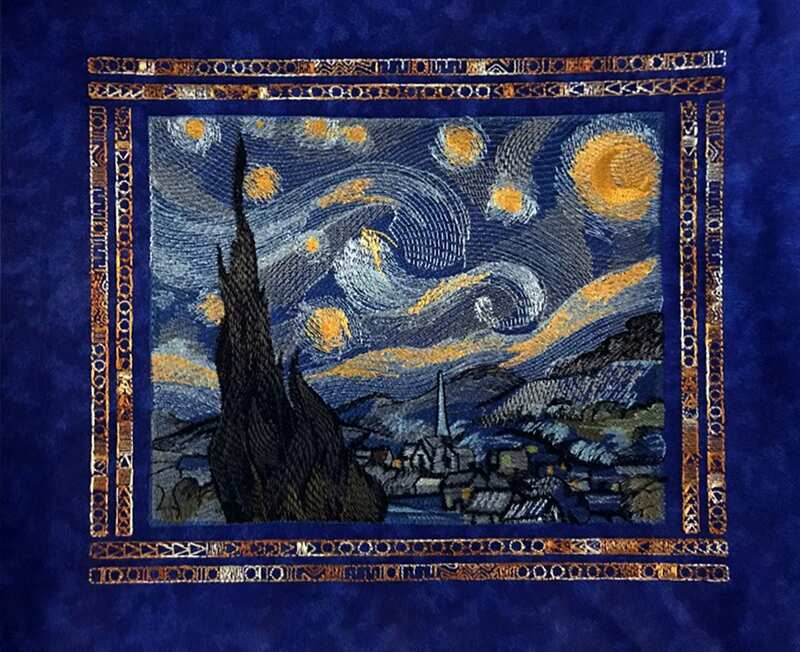 Based on an original oil painting by Vincent van Gogh, this tapestry is an embroidered representation of "The Starry Night." The original painting was completed in 1889, and it is one of three pieces he did depicting stars at night. The original painting now hangs in the Museum of Modern Art in NYC. 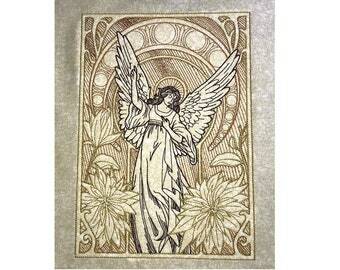 **All of these exact tapestries shown are already sold** -- but it can be remade on your choice of fabric color! 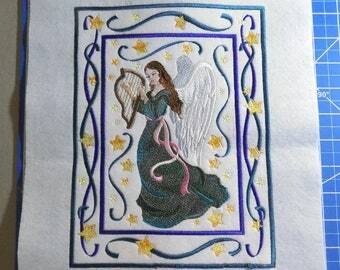 One of the photos shows the design on blue next to it on purple so that you can see how the background color of the fabric affects the look and feel of the piece. It's also striking on black and smoky gray (both shown above)! 1. There is the night sky filled with swirling clouds, stars ablaze with their own luminescence, and a bright crescent moon. Although the features are exaggerated, this is a scene we can all relate to, and also one that most individuals feel comfortable and at ease with. This sky keeps the viewer's eyes moving about the painting, following the curves and creating a visual dot to dot with the stars. This movement keeps the onlooker involved in the painting while the other factors take hold. 2. Below the rolling hills of the horizon lies a small town. There is a peaceful essence flowing from the structures. Perhaps the cool dark colors and the fiery windows spark memories of our own warm childhood years filled with imagination of what exists in the night and dark starry skies. The center point of the town is the tall steeple of the church, reigning largely over the smaller buildings. This steeple casts down a sense of stability onto the town, and also creates a sense of size and seclusion. 3. To the left of the painting there is a massive dark structure that develops an even greater sense of size and isolation. This structure is magnificent when compared to the scale of other objects in the painting. The curving lines mirror that of the sky and create the sensation of depth in the painting. This structure also allows the viewer to interpret what it is. From a mountain to a leafy bush, the analysis of this formation is wide and full of variety.